The Old Man of Storr....Located on the Trotternish Peninsula and is due to a massive landslide of block over 6500 years ago. It gets its name because the rock outline and the protruding pinnacle resemble the face of an old man. On this day it was raining and very windy. 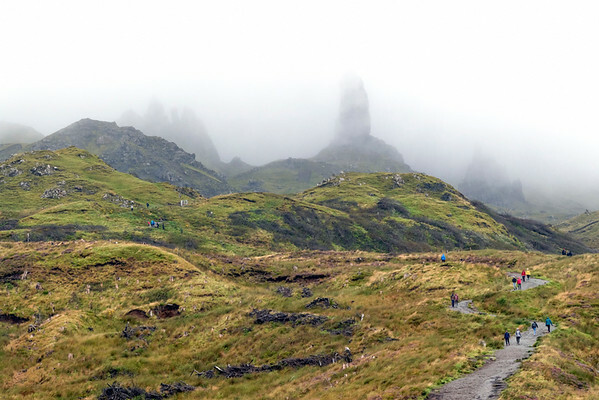 It was almost as though the Old Man of Storr was having a bad day. It is an hours walk to Storr and my wife made it about half way and I eventually had to turn back. I captured this shot on the way up though. You can see the block in the background draped in fog. Then there are the people beginning and returning leaving the question will they or did they make it or not?